The National Democratic Alliance government’s parliamentary managers have a busy weekend ahead, says Rediff.com contributor Anita Katyal. 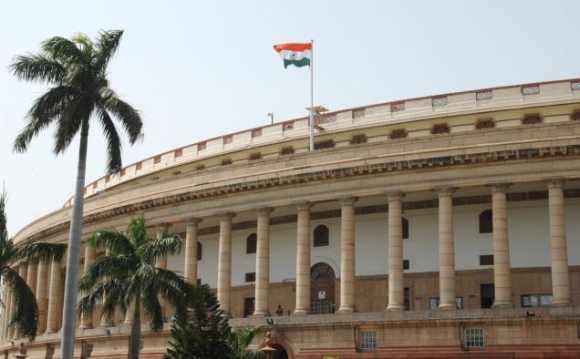 They have to work overtime over the next two days to ensure a division in the opposition ranks in the Rajya Sabha for the successful passage of its Insurance Bill on Monday. The Insurance Laws (Amendment) Bill, which raises the foreign investment cap in the insurance sector from 26 to 49 per cent, was to be tabled in the Upper House on Thursday but had to be withdrawn at the last minute when the opposition parties raised objections to the manner in which this important legislation was being rushed. Having succeeded in embarrassing the Narendra Modi-led yesterday, nine opposition parties, accounting for 125 members in the Upper House, followed up by sending a signed letter to Rajya Sabha chairman Hamid Ansari on Friday requesting that the Bill be referred to a select committee for a detailed scrutiny. The Bill is slated for introduction on Monday. The signatories include the Congress, the two Left parties, Samajwadi Party, Bahujan Samaj Party, Trinamool Congress, Rashtriya Janata Dal, the Janata Dal-United, the Nationalist Congress Party and the Dravida Munetra Kazhagam. The Jayalalithaa-led All India Dravida Munetra Kazhagam has not signed the letter but its members have objected to the unseemly hurry in which the government is pushing ahead with this important legislation. Although the Insurance Bill was initiated by the Congress-led United Progressive Alliance government, it has been hanging fire since 2008 because it was successfully blocked by the Bharatiya Janata Party when it was in the opposition. But two months after forming the government, the BJP has resurrected the same Bill and is now seeking its expeditious passage. Touted as its major reform measure, the Modi government wants to push through this legislation at the earliest to send out an unambiguous message to the international community that it is serious about pursuing economic reforms. The ruling alliance is particularly keen that the Bill be passed before Prime Minister Narendra Modi visits the United States this September where he will pitch for foreign investments by projecting his government as being reforms friendly. As it happens, the Modi government has not got off to a flying start as far as its international image is concerned. US secretary of state John Kerry who met Modi on Friday conveyed his country’s unhappiness over India’s refusal to sign a global trade deal. “Failure to sign the Trade Facilitation Agreement sent a confusing signal and undermined the very image Prime Minister Modi is trying to send about India," Kerry is said to have told the prime minister. While the BJP is keen to correct this perception, the Congress has now got an opportunity to pay back its political opponent in the same coin, having been at the receiving end of its stalling tactics. The Congress cannot reject the Bill outright since it was first moved by it but it wants the BJP to sweat it out. Moreover, it did not want to break ranks with other opposition parties which have banded together on this issue. The BJP will face no problems in pushing through the Bill in the Lok Sabha because it has a brute majority there. However, the BJP has to necessarily do business with the opposition in the Rajya Sabha where it is in a minority. Having got a chance to show down the ruling alliance, the Congress has taken the plea that the Bill should be referred to a parliamentary panel as the government has introduced a number of substantial changes in it. “The government has introduced as many as 11 amendments…. These need to be scrutinised first,” Anand Sharma, former Union minister and Congress deputy leader, Rajya Sabha, told rediff.com. Although a united opposition has succeeded in cornering the NDA government, it is to be seen if they will stick together in the coming days. The BJP’s parliamentary managers will be working the phones over the week-end in an effort to create divisions in the opposition ranks. This is exactly what it had done for the passage of the Telecom Regulatory Authority of India amendment Bill which paved the way for the appointment of former telecom regulator chief Nripendra Misra as the prime minister’s principal secretary. The BJP succeeded in weaning away opposition parties such as the Trinamool Congress, the AIADMK and the Biju Janata Dal as well as Congress allies Nationalist Congress Party, the Samajwadi Party and the Bahujan Samaj Party to secure a huge majority for its Bill. Parliamentary affairs minister M.Venkaiah Naidu and other senior BJP ministers including Arun Jaitley had contacted Trinamool chief Mamata Banerjee and other regional chief ministers who were lured with financial packages for their respective states. Besides, Mamata Banerjee is on the backfoot over the ongoing CBI inquiry into the Shardha chit fund scam. “Today the number of Rajya Sabha members opposing the insrtuance Bill is 125… let’s see what happens on Monday,” remarked a senior CPM leader. It is possible that the Trinammol Congress, the AIADMK and the BJD could eventually bail out the government. “Our case will be ruined even if one of the 125 signatories backs out on Monday,” said a Congress leader. On its part, the ruling alliance is in no mood to accept the opposition demand to send the Bill to a select committee. Confident BJP leaders said they succeeded in getting the Bill passed, adding mysteriously that they had a few surprises in store. The BJP said there is no need to refer the Bill to a parliamentary panel as most of the amendments were introduced by former finance minister P Chidambaram, adding that this is essentially a UPA Bill. Is Narendra Modi's charisma beginning to fade already?